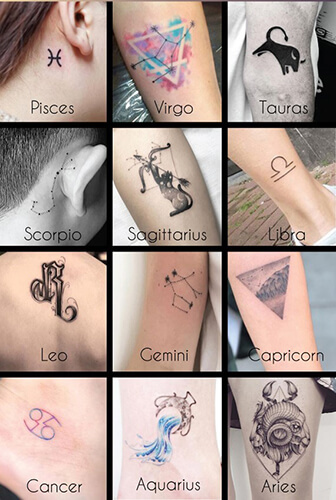 Horoscope tattoos are one of the most popular tattoo ideas out there, and for good reason – each of the zodiac signs has different symbols, meanings and associations to them, all of which are unique to that constellation. If you’re looking for tattoo ideas, we’re laying out some of the possibilities you could choose from. 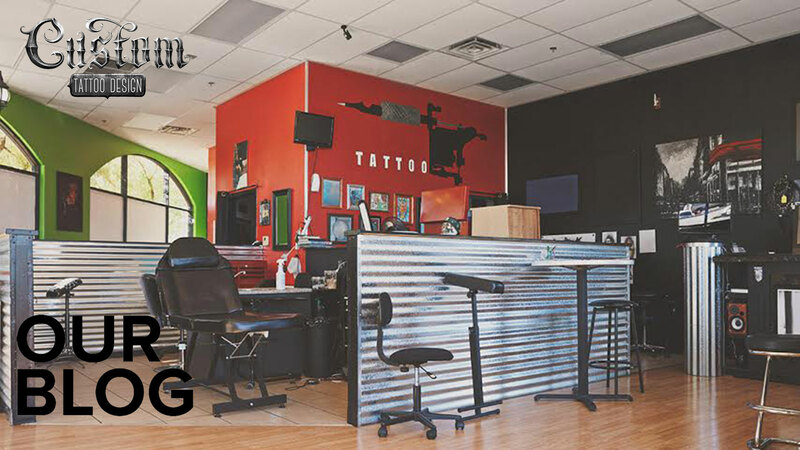 First, decide whether you want a simple design or something more complex, and what style you like before you hone in on a specific tattoo idea – it’ll make life easier for you and your chosen artist. 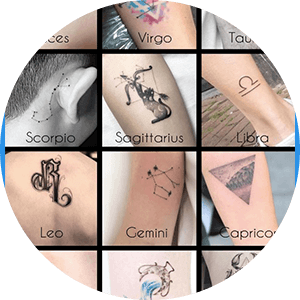 Read on to find out more about your horoscope sign, and what kinds of things you should include in your tattoo design. Scorpio Tattoo Ideas – When it comes to Scorpio tattoo ideas, you have quite a few options. While the obvious association would be a Scorpion, the Scorpio sign is actually also linked to the eagle and phoenix. Any tattoo design involving those 3 animals can be representative of the Scorpio zodiac sign. This constellation is also a water sign, so you could incorporate water into the tattoo design as well to really make it clear that you’re repping your star sign. Scorpio has two ruling planets, Mars and Pluto, so to add more detail to your Scorpio tattoo design consider some of the elements from these planets. Aquarius Tattoo Ideas – Aquarius is a water-bearer sign that’s typically represented by waves. This can be a simple tattoo design involving a double layered wave, or you could include essentially any idea that involves water. Water being poured from an ancient greek jug is another classic symbol of this star sign. It’s ruling planet is Uranus, so if you want to add more detail you could incorporate this planet into your Aquarius tattoo ideas. Capricorn Tattoo Ideas – Capricorn isn’t just a horned goat, is the sea-goat sign, so you can get creative with this one. A design that’s half horned goat and half mermaid would be the perfect idea for a Capricorn tattoo. Oddly enough, this is an earth sign, so if you want to use all of the symbols of this constellation, use the earth element in your design idea. The ruling planet for Capricorn is Saturn, which can be used to add more details to your tattoo design idea. Taurus Tattoo Ideas – The most stubborn of the star signs, Taurus is represented by the mighty bull. It’s considered a feminine sign, ruled by Venus. A bull in any form, with or without the classic nose ring, can be a symbol for the Taurus zodiac, but to add more detail you can include it’s element in your design as well, which is earth. Cancer Tattoo Ideas – Cancer is a water sign that’s ruled by the moon, so these are a couple of details you could include with your zodiac tattoo. The main image is typically a crab, but you have a couple of design options here. You can go with the animal for the symbol of your Cancer star sign, or go with what looks like a horizontal 69 if you choose a simpler design scheme. These in addition to it’s finer detail likes the moon and water elements can make for a clear Cancer tattoo. Gemini Tattoo Ideas – Commonly known as the twin star sign, Gemini is representative of the mythological siblings Castor and Pollux. Any kind of symbol that represents twins can be indicative off the Gemini sign, including simple roman numerals with lines across the top and bottom, to twin animals, or people. Gemini is ruled by the planet Mercury, and its element is air, which can both be used to add a bit more depth and detail to the tattoo design. 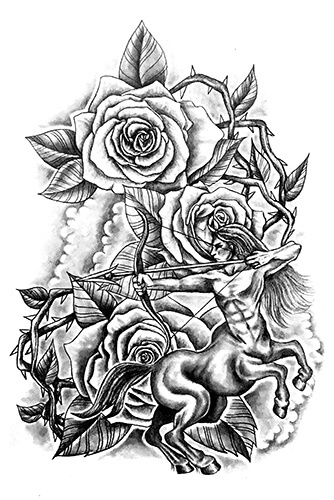 Sagittarius Tattoo Ideas – Sagittarius is another star sign that gives you a few different options for design ideas. It’s symbol is the archer, which can be represented by a bow and cocked arrow, a figure holding a bow and arrow, or most classically, a centaur with a bow and arrow that’s ready to fire. Sagittarius is a fire sign, and its ruling planet is Jupiter so add these details if you want a more complex tattoo design. Leo Tattoo Ideas – The lion is the king of the jungle and Leo is the king is the king of the star signs. Leo is most recognized by its lion symbol, so any design that involves the king of the pride can be representative of the Leo zodiac sign. 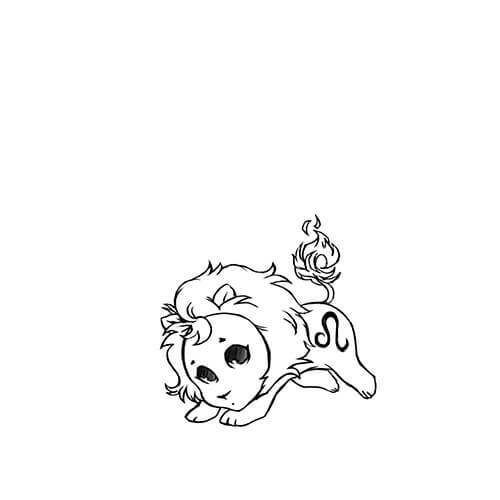 In true ruling fashion, Leo is ruled by the sun, and its element, not surprisingly, is fire. 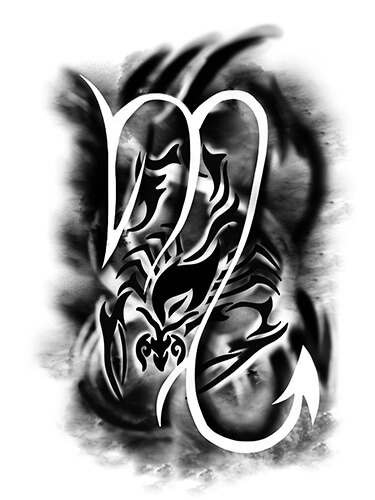 Aries Tattoo Ideas – Don’t confuse this horned figure for the Taurus zodiac, because they’re completely different symbols. The Aries sign is represented by the ram, and can be easily mixed up with a bull if you’re not careful. To make it clear that your tattoo design is the Aries ram, you can add in elements of fire, and the ruling planet Mars. This is the masculine opposite of the bull, which is ruled by the feminine Venus. Virgo Tattoo Ideas – Virgo is the symbol for the virgin, which can represented in a couple of different ways. The maiden is most often associated with this zodiac sign, but that can be symbolized using either a female figure, or the tarot card maiden bird. A slightly less literal interpretation is that of the letter ‘m’ with a loop at the end of it. Virgo is ruled by Mercury, is an earth sign, so these elements can be added for additional details. 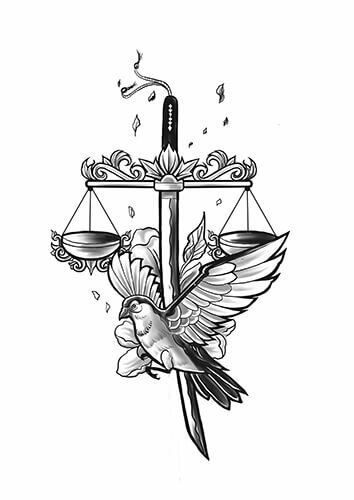 Libra Tattoo Ideas – Libra is often associated with the scales of justice, because that’s exactly what they represent. The scales for this star sign are more about being fair and balanced than just, but a scale is the classic symbol for this constellation. Libra is ruled over by the feminine Venus, like Taurus, and its element is earth, which can be used to add some complexity to your Libra tattoo design. Pisces Tattoo Ideas – The symbol associated with Pisces is the fish, but not just one fish. 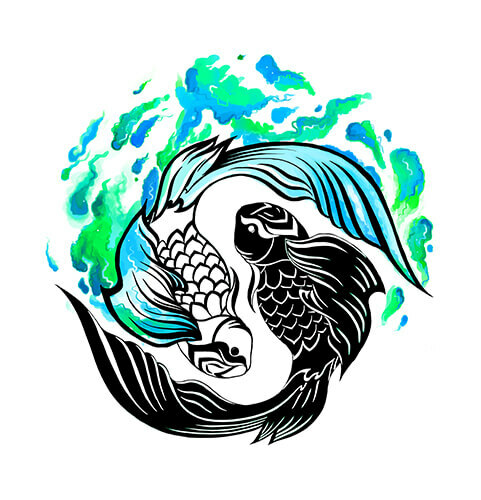 Pisces is made up of two fish, side by side, one facing up and one facing down. The element for this star sign, as you may have guessed is, water, which makes for an easy tattoo pairing. The ruling planet for Pisces is Neptune, or Poseidon in ancient Greek lore, so you can get really creative with this constellation tattoo design. Whatever your zodiac sign is, these symbols make for great tattoo ideas. Using the classic elements and traditional figures assigned to each constellation, it’s easy to rep your specific horoscope in a way that’s unique to you. 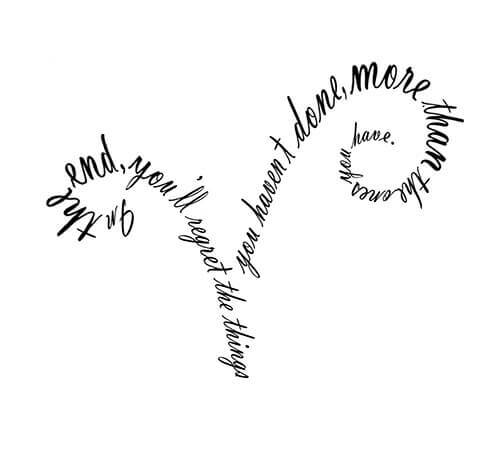 Do you have a horoscope tattoo idea? Let us know in the comments!